Manufacturers, distributors, and builders are all reporting a critical need for training as they rebuild from the recession and hire new employees. New hires often lack knowledge and understanding of engineered wood products, design considerations, and installation recommendations. Even experienced sales personnel can benefit from a refresher. 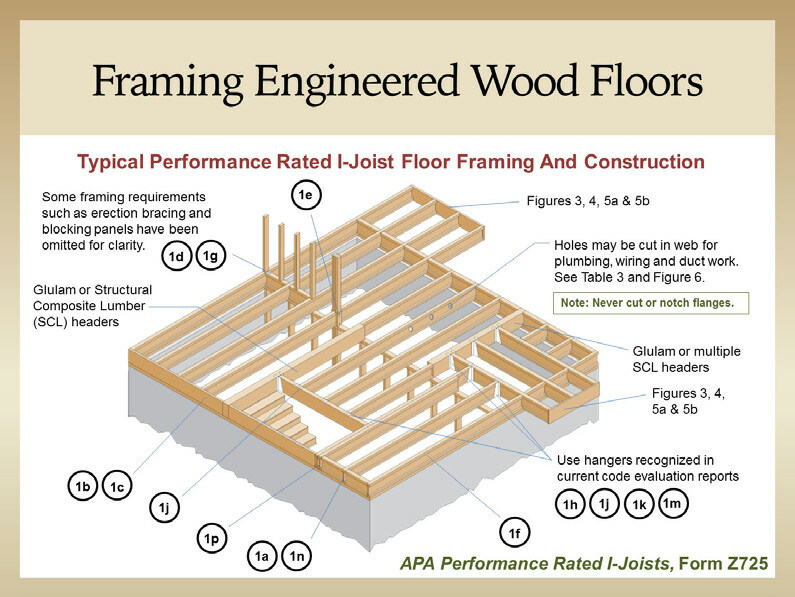 APA’s comprehensive training series includes six “back to basics” modules that cover key topics related to I-joists, Rim Board®, laminated veneer lumber, and glulam. This training targets distribution sales staffs who can, in turn, share the knowledge and training with their retail and builder customers. The training modules run between 30 and 90 minutes each. Modules A through D are designed to build knowledge and understanding from basic to more complex topics and are best completed in sequence. The fifth and sixth modules, Best Practices in Storage and Handling and Glulam Beam and Header Applications, can be taken as stand-alone presentations. Each module is presented by an APA Engineered Wood Specialist. Who will benefit from training? Distributor sales personnel, especially new hires and technical sales staff, will benefit from all modules. Distribution and retail yard personnel, forklift operators, loaders, material handlers, and those responsible for storage and handling of EWP on building sites will also benefit from Modules A and E.
There are no prerequisites, but to get the most benefit from the program, trainees should be familiar with basic concepts and terminology of residential and light commercial wood frame construction. 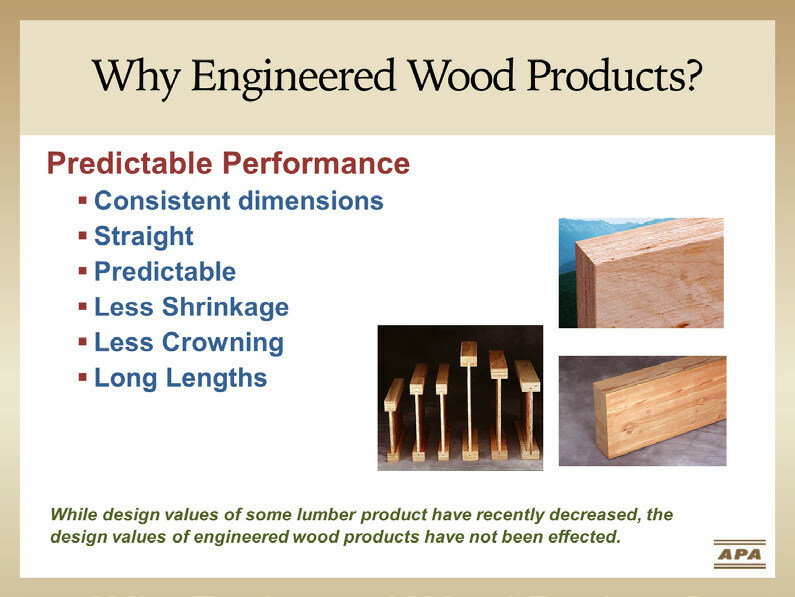 An elementary understanding of the mechanical concepts like shear and bending moments in beams is also useful for modules B, C, D, and F.
This module is designed for trainees new to the EWP industry and includes an introduction to the types of engineered wood products, a discussion of their typical applications in light-frame construction and presents benefits of engineered wood products over competing products. AIA LU available. Approximate length: 1 hour. • Appropriate applications/uses for each. 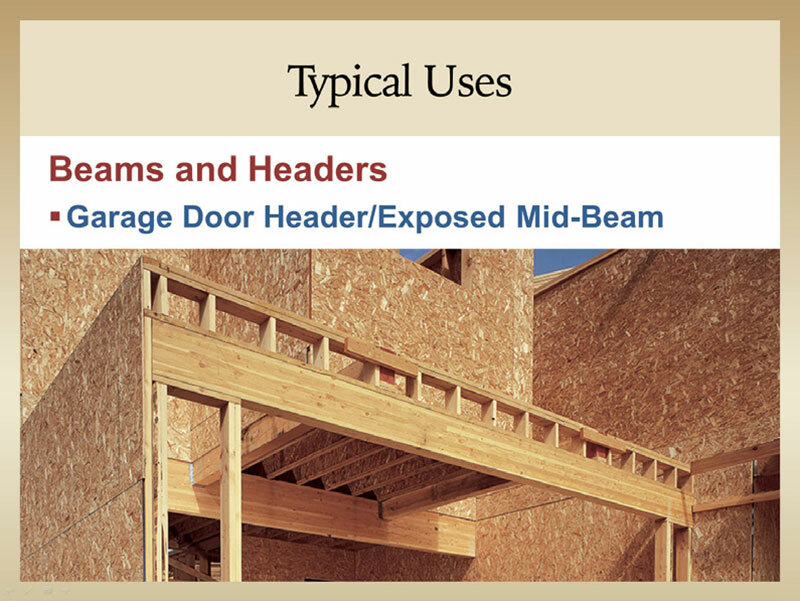 This module introduces trainees to the types of loads on buildings, designing for load paths, load factors, simple and multiple spans, and using span tables in specifying I-joists and rim board in floor systems. AIA LU available. Approximate length: 1 hour. • Specifying engineered wood products. This module introduces trainees to best practices in the design of engineered floor systems. It includes recommendations for I-joist and rim board layout, and the proper use of joist hangers, squash blocks and web stiffeners for transferring vertical loads. It also includes a review of framing details and recommended notching and drilling practices to maintain structural integrity. AIA LU available. Approximate length: 75 minutes. • Correct use of web stiffeners, squash blocks and blocking for I-joist floors. This module introduces trainees to best practices in the design of engineered roof systems. It includes recommendations for the proper use of joist hangers, squash blocks and web stiffeners for transferring roof loads for a variety of common roof types. It also includes a review of framing details and recommended notching and drilling practices to maintain structural integrity. No CEUs available at this time. Approximate length: 45 minutes. 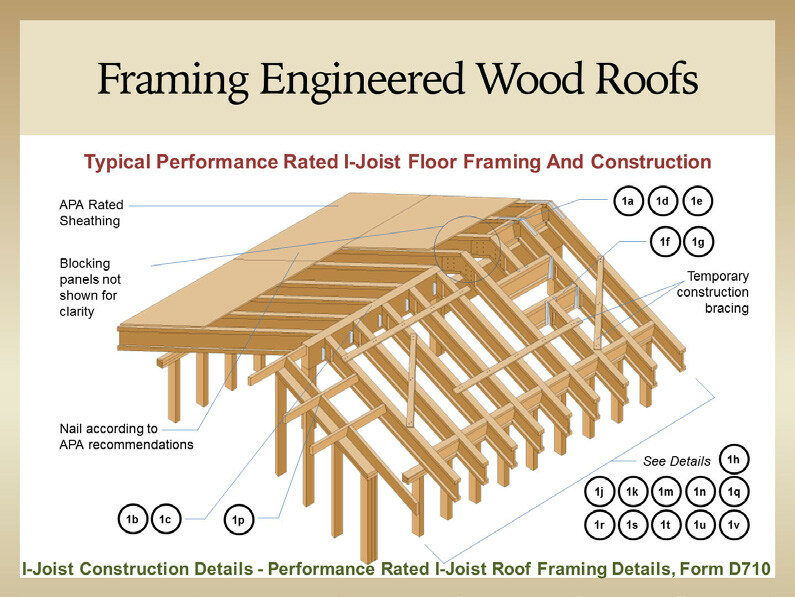 • Correct use of web stiffeners and blocking in I-joist roof systems. 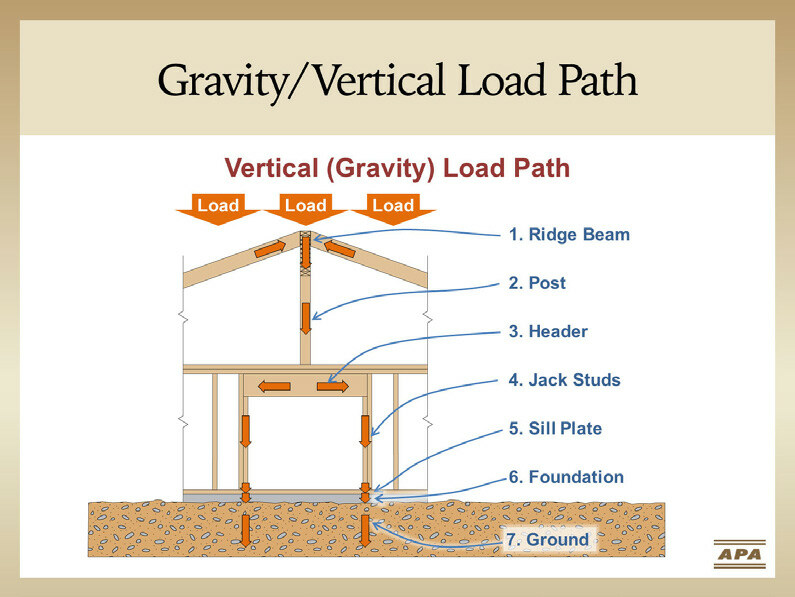 This presentation covers best practices in the storage and handling of I-joists, laminated veneer lumber (LVL) and laminated strand lumber (LSL) in distribution yards and on the jobsite. The module includes both good storage and handling examples as well as examples of practices to avoid. No CEUs available at this time.​ Approximate length: 30 minutes. 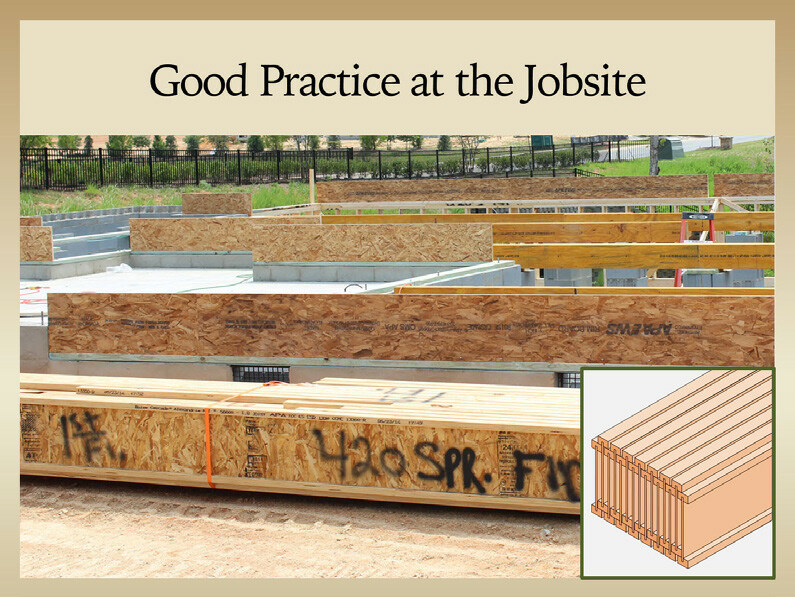 • Best practices in the handling and storage of I-joists, LVL and LSL on the jobsite and in distribution yards. This presentation is a detailed introduction to the uses and specification of glulam for beams, headers and columns. Topics include glulam construction and anatomy, typical applications, appearance classifications, preservative treatments and finishing, notching, drilling and connection details, specifying beams and headers, and understanding the glulam trademark (grade stamp). AIA LU available. Approximate length: 75 minutes. • Factory and field applied stains/finishes.